Design Build Partners is proud to have designed and built a number of veterinary practices such as Carothers Parkway Veterinary Clinic in Brentwood, TN and Richland Animal Clinic in the Belle Meade area of Nashville, TN. Whether it is an animal clinic, hospital, pet resort, or emergency care facility, we have the expertise to design a unique custom space with your needs at the forefront. 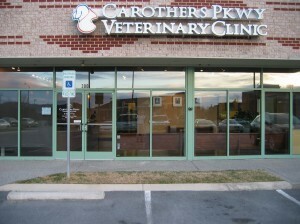 Our architects provide a comprehensive approach to veterinary design and facility construction. We are a true design build firm that takes and integrated approach to projects from the initial idea and planning stage to design, breaking ground, and constructing your new animal facility. The veterinary practices we have worked with have told us that experience matters. It is our goal to design and build a long-lasting functional space that is ideal for the animals left in your care as well as your staff. The veterinary clinics we have built in the local area offer a safe and comfortable space for owners and their pets. We have learned from experience things that come from building several facilities. The architects at Design Build Partners create design options that maximize your hospital/clinic space and offer custom design ideas. We definitely have future growth in mind as we design and listen to your specific needs. We are committed to staying within budget if you choose to have us build your facility.